Happy new year from the Bat Detective team, and welcome to the next leg of our World Tour! Having spent the last month searching for bats in Ghana, we’ve travelled south to Zambia, another country in sub-Saharan Africa with high biodiversity and amazing wildlife. Today we’ve uploaded a new set of audio data to Bat Detective, containing recordings made in Kasanka National Park, which is shown on the map below. Head to the Bat Detective site now to start exploring the new data and classifying calls. Kasanka is a relatively small national park located in the Lake Bangweulu basin, but has a broad range of habitats and an associated rich array of wildlife species, from famous large African fauna such as hippo and elephant, to a wide diversity of birds and bats. 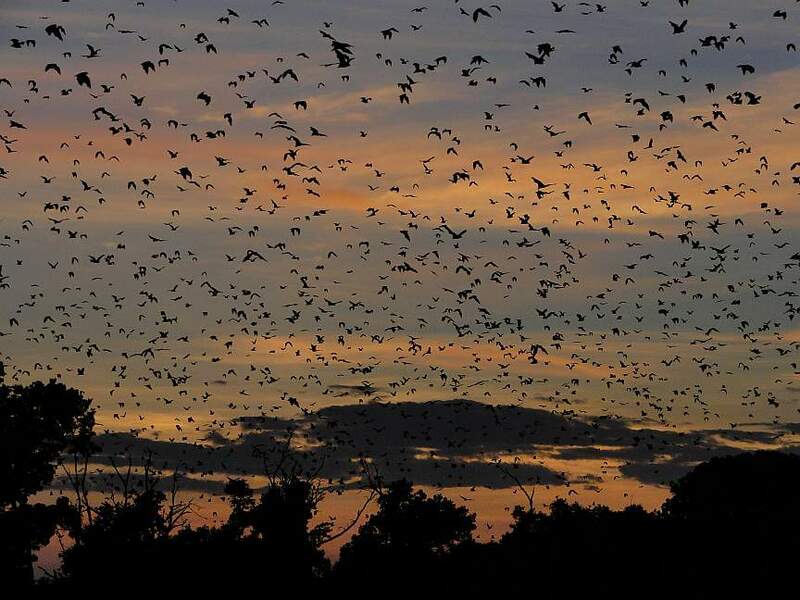 Indeed, like Accra where our Ghanaian World Tour audio data were recorded, one of Kasanka’s most famous wildlife sights is its massive gatherings of straw-coloured fruit bats (Eidolon helvum). Each year, in November and December, around 1.5 million individuals arrive in Kasanka from the Congo Basin to feed from ripening fruit trees, in one of Africa’s most spectacular wildlife migrations (pictured below). Already known as one of the continent’s most widespread bat species, found from the base of the Sahara desert all the way to South Africa, research in recent years has confirmed that straw-coloured fruit bats are highly mobile and migratory. Recent research taking genetic samples from individuals across mainland Africa found that the straw-coloured fruit bat population is genetically mixed across the entire continent – an indicator of a highly connected population at a huge geographical scale. Indeed, tracking studies have also shown that individuals can travel huge distances, covering up to 370 kilometres in a night. 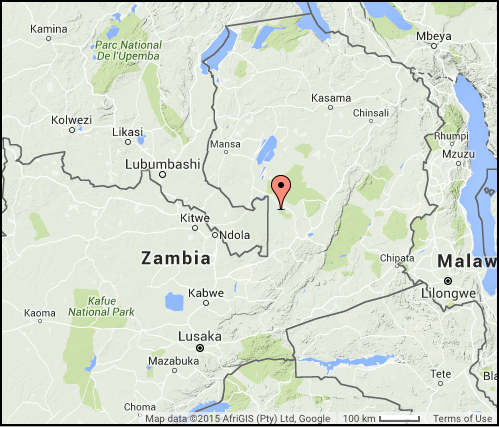 Similarly to our Ghana data, however, you won’t hear any fruit bats in these audio recordings from Zambia. The Pteropodidae, the genus to which fruit bats belong, do not use true ultrasonic echolocation to navigate, communicate and search for food. However, Kasanka is home to a rich diversity of echolocating bat species, which you might encounter while listening through the data. 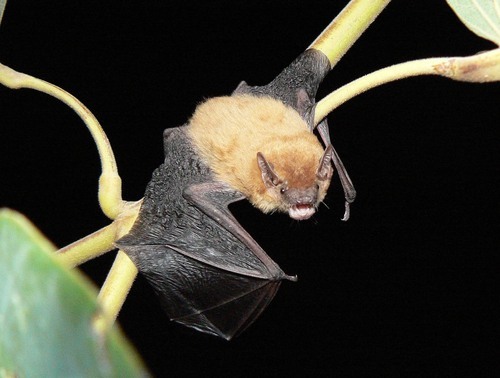 Among these are two species of horseshoe bat, Lander’s and Hildebrandt’s horseshoe bat, with their distinctive constant-frequency calls; the tiny Schlieffen’s twilight bat (pictured below); and the banana pipistrelle, named for its habit of nesting in the leaves of banana and plantain trees. You might also have encountered some of the more widespread African species, such as the Angolan free-tailed bat, in our Ghana recordings. Similarly to the Ghana data, the recordings from Zambia are very acoustically diverse – see our Ghana blog post for a guide to some of the sounds you might encounter. Occasionally mechanical noise or insect chirps can prove very challenging to tell apart from bat calls – if you’re unsure if a recording contains a bat call, just use the Talk section to flag it up and discuss with other users and the Bat Detective team. Good luck and happy searching!